Gossip is an important element of every culture, be it in the café, corridor or conference room. In fact, Nobel Laureate Daniel Kahneman writes in the introduction of his new book “Thinking, fast & slow” that the primary objective of the book is to generate intelligent water cooler gossip. Which is the most powerful source of gossip? Perhaps there is no easy answer. However, “weighing scale” is certainly a good candidate. When ten of us, old school friends, met a couple of weeks back after a long time, the starting point of the conversation was invariably – how much weight one has gained or lost. What makes “weighing scale” such a remarkable gossip generator? Can we design “weighing scale” for measuring innovativeness? Let’s explore. The first thing that strikes about any weighing scale is its simplicity. You don’t need a user manual. Have you seen 6-7 year olds weighing themselves? They don’t need any help. The second interesting property of weighing scale is its ease of access. As a kid I remember how weighing was performed as a ritual at the railway platforms every time we traveled by a local train in Mumbai. 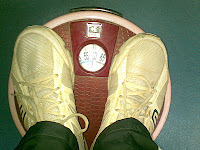 Anyone who is interested in weighing can find one – either free or at a low cost. The third property is very special and perhaps not understood by most as unique. Weighing scale is emotion-proof. It gives the same weight no matter how angry or anxious you are. Contrast this with blood pressure machine, voting machine and stock price – all are anxiety dependent. Combination of the first two properties, simplicity & ease of access, creates what is sometimes called a self-test. It is like saying, “Go check it yourself”. Kahneman observes in “Thinking, fast & slow” that embedding “self-test” in the research papers helped he & his co-author Amos Tversky reach out to a wider audience outside psychology fraternity. Authors Chip & Dan Heath mention in “Made to stick” that self-test is a powerful way to build credibility for your idea. An ECG or an MRI scan are not self-tests. Neither can you do it yourself (yet), nor can you diagnose the results. Designing a measurement system that has a self-test and is emotion-proof is like creating a “weighing scale”. At the very least, you are generating an intelligent gossip. When I wrote about a simple innovation dashboard for checking how innovative you are a year and a half ago, I was trying to create a “weighing scale”. Contrast this with a perceptual survey which is based on questions like “Do you feel the environment in your company is conducive for innovation?” etc. It is neither self-testable nor emotion-proof. I don’t mean to say that these kinds of surveys are not useful. It is just that they are not “weighing scale” like and hence may not lead to intelligent gossip. In the spring of 1884, Thomas Edison supervised 2,774 lamp experiments at Menlo Park. In 2010, Google engineers performed 20,000 experiments to improve the search algorithm and took 500 ideas live. Won’t it help to build a richer vocabulary of this kind and in fact, generate intelligent gossip from it? I believe it can be a first step in building a culture of innovation. Simplicity & Ease of use are the true measures of anything - be it innovation or sales or even designing incentive scheme for employees. However complex the underlying stuff is, it needs to be expressed in simple, easy to understand language. Excellent Vinay. I liked the analogy especially being objective like the weighing machine. I know on many occasions, we seem to be dependent on surveys for measuring an attribute. Thanks for the wishes, Ganesh. I remembered our work together during CMM assessment a decade ago. CMM wasn't simple to use - 22 process areas are overwhelming and wasn't easy to access as well. Not much room of intelligent gossip. What do you think? You don't want the result to be a negative number. Originally studied by the psychologist Robyn Dawes. This blog is nice.Perk Mercantile incepted in the year 1990, in Mumbai at Shalimar Industrial Estate – Matunga. Today Perk Mercantile Is a Multi-Product Multi-Technology Divisions.Weighing Machine. this is very good view related to all type of Weighing scale.. Ever since I started using the digital scale, I realized how accurate the results are. Moreover, it helped saving my time to a great extent, as I do not need to pay due attention, as I place anything to be measured, the result is showing automatically on the screen.